The remote Dell Remote Access Controller (iDRAC6 / iDRAC7) is affected by a cross-site scripting vulnerability. 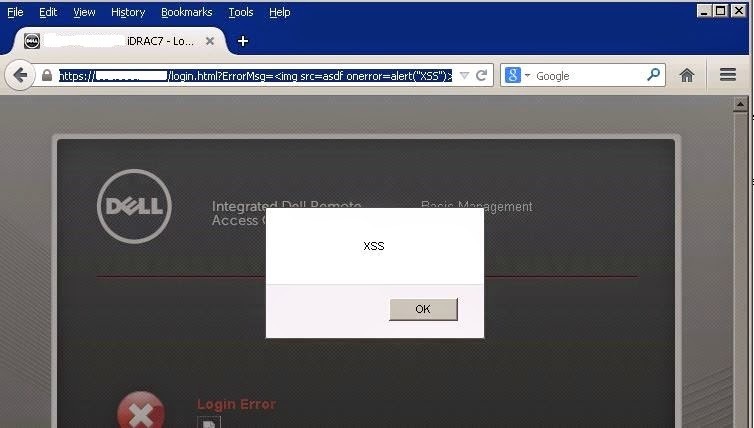 The login page does not properly sanitize user-supplied input to the 'ErrorMsg' parameter. An attacker could leverage this to inject arbitrary HTML and script code into a user's browser to be executed within the security context of the affected site. 1) Actually the login page does filter some Java scripts, so if you use the common script like <script>alert(1)</script>, it won’t work. 1) Upgrade to firmware version 1.96 (iDRAC6) / 1.46.45 (iDRAC7) or later.